A few weeks ago, DogTime.com told you about a starving dog who was found with a coffee can around her neck. Veterinarians estimate that the metal can had been around the animal’s neck for at least a month. 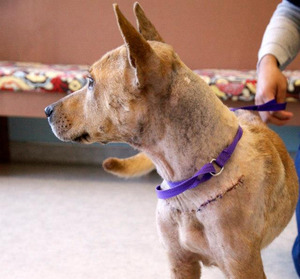 By the time that Olivia, originally named Java, was discovered in the Dallas area, the sharp edges of the can had nearly embedded themselves into the dog’s neck and head, creating deep wounds in her jawbone and ear canal that would require immediate surgery. Veterinarians at the Metro Paws Animal Hospital estimated that the can had likely been around Olivia’s neck for at least a month—likely longer. Olivia’s veterinarians also determined that she had given birth within the past month, meaning that whoever had cruelly placed the can around her neck likely saw that Olivia was visibly pregnant. Vets say that, given Olivia’s condition and the fact the can likely prevented her from reaching her pups, it is unlikely that the litter survived. Several weeks after she was found, Olivia is now thriving, enjoying short walks outside and the many toys that have been sent to her from well-wishers around the world. Her health has improved drastically; all of her bandages have been removed, and she has already had her spay surgery. “She has gained about 12-15 lbs., looks very good, still thin, but not the awful emaciated ribs and hip bones any longer,” an Animal Allies rep told OpposingViews.com. When her rescuer brought her into Dallas Animal Services that day, Olivia wasn’t alone; loyal Shepherd mix Joshua, who was found alongside Olivia, was rescued too. Joshua has been staying with a foster parent in the Dallas area and is doing great. An update on the Animal Allies of Texas Facebook page Saturday shows Joshua and Olivia reuniting for the first time since their rescue. No one knows yet how Olivia ended up with that can around her neck, but Dallas Animal Services is keeping the case open. Anyone with information is asked to contact them immediately at (214) 670-6800. For more information on Olivia and her buddy Joshua, check the Animal Allies of Texas Facebook page.